This way of frying rice vermicelli is not what my late mum had taught me though fried rice vermicelli is a common menu item when I was a kid. 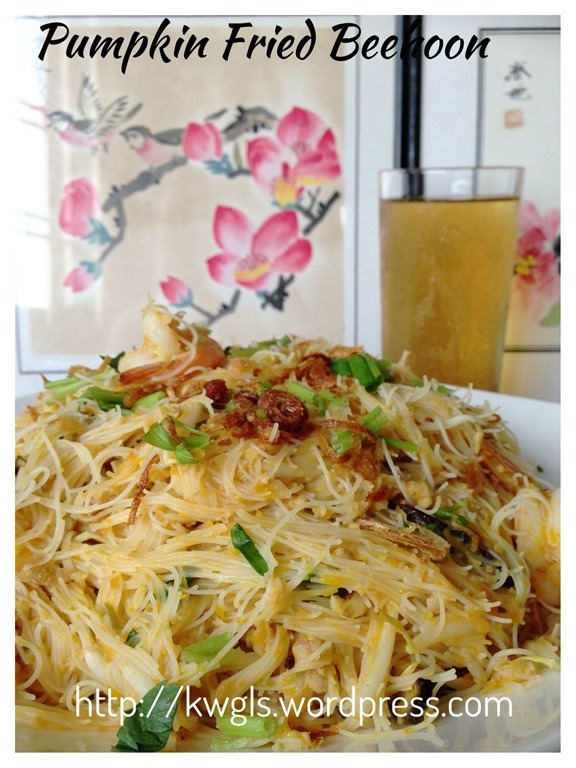 The way she fried bee hoon is totally different, she will sauté the shallots until fragrant, add the rice vermicelli, add seasonings until the rice vermicelli is aromatic. 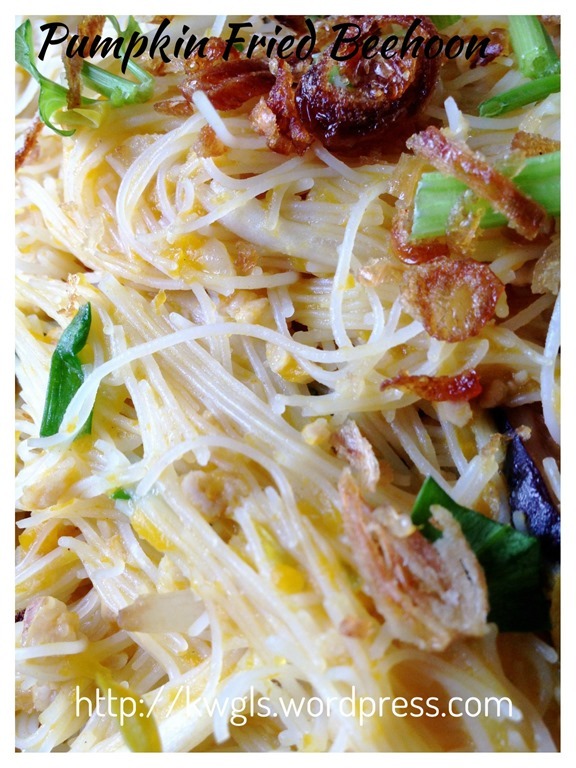 She then dished up the plain rice vermicelli. She put some more oil, sauté the shallots again but this time with meat, prawns and vegetable etc..Once this is ready, she will put the stir fried bee hoon earlier, stir until well mixed and dished up..
Years ago, when I watched a Taiwanese television food show, the host was demonstrating how he stir fried the famous Taiwanese snack – Pumpkin Bee hoon… Instead of using the word stir frying, soaking may be a more appropriate word of describing the process. In fact, he is soaking the bee hoon in some meat stock until all the flavourful stock were absorbed by the bee hoon. 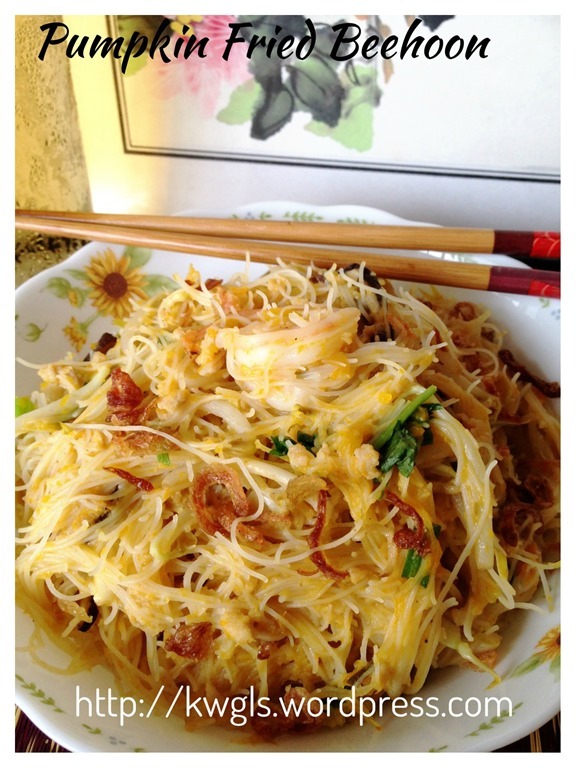 Since then, I have changed my way of frying my bee hoon. 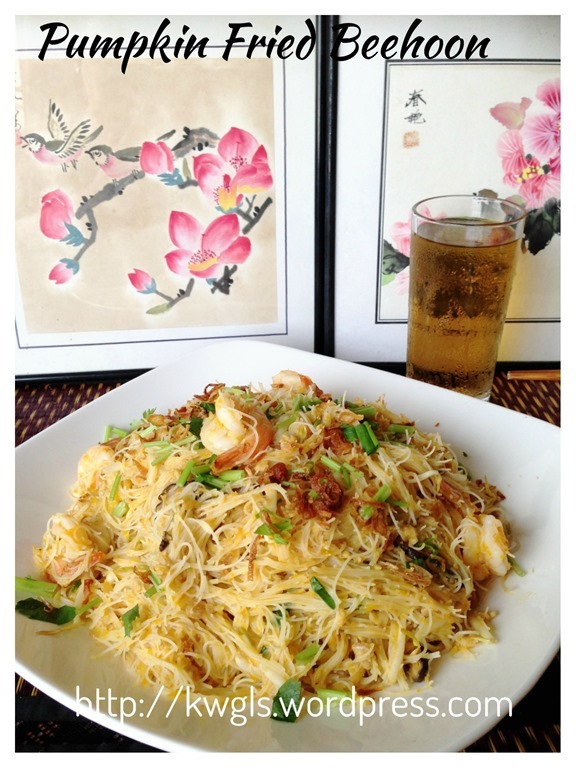 I have used his approach in stir frying many types of bee hoon recipes and it all works well. 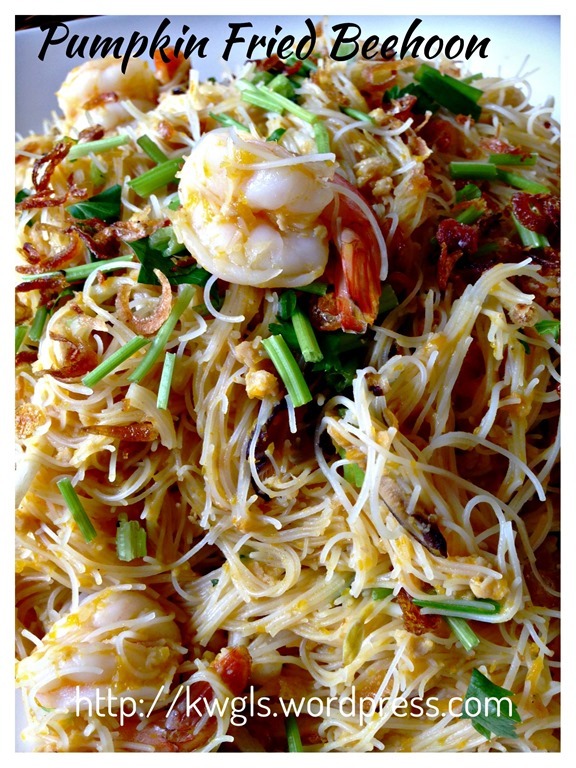 Well, this way of cooking can only be applicable to bee hoon and not other type of noodles be it flat rice noodles (kuay tiao), normal egg noodles and etc.. As bee hoon is very dry and tough to get cooked, soaking them in flavourful stock possibly will be the best method of cooking bee hoon. 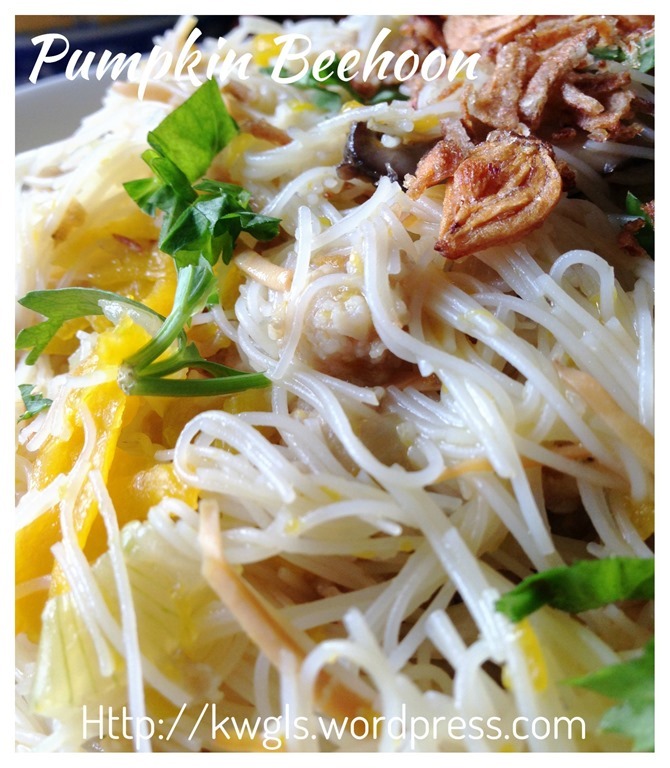 This is a famous Taiwanese noodle dish… There are two ways with regards to the preparation of the pumpkin, one way is to julienne the pumpkin into small strips and stir fry together with the Bee Hoon. 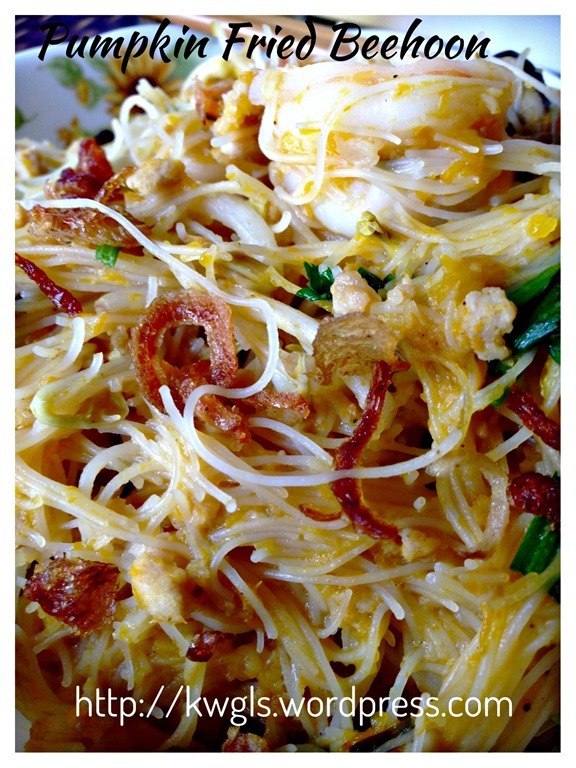 At the end of the day, you can see the pumpkin strips on the plate of bee hoon. Another way is the method I am going to share in this illustration, steam and prepare the pumpkin puree, let the bee hoon soaked in the thick pumpkin “soup” and the end result is every strand of bee hoon was coated with pumpkin puree.. 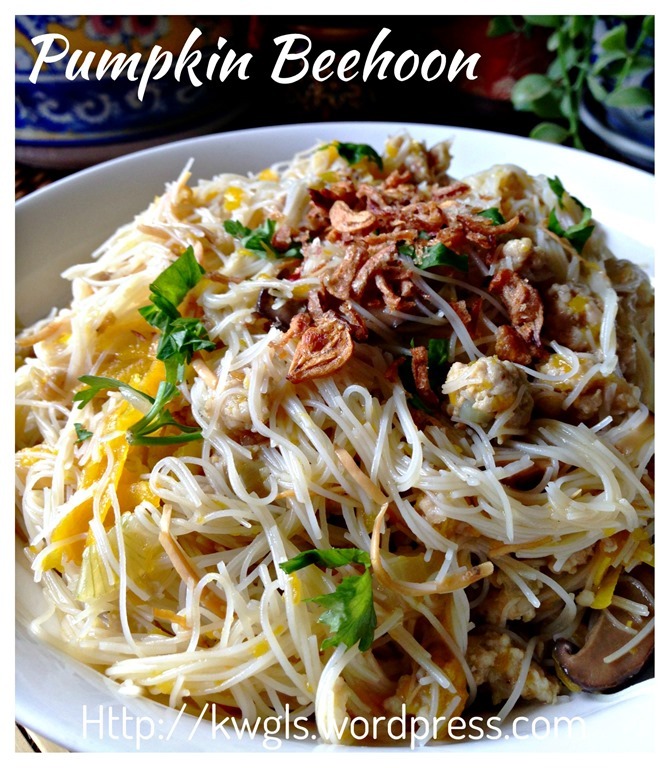 Asked me which do I prefer, the pumpkin puree version as the pumpkin puree can sip into the bee hoon more easily. 250 grams of pumpkin – de-skinned and cut into small chunks. Rinse and soak the bee hoon until soft. Steam the pumpkin until soft. 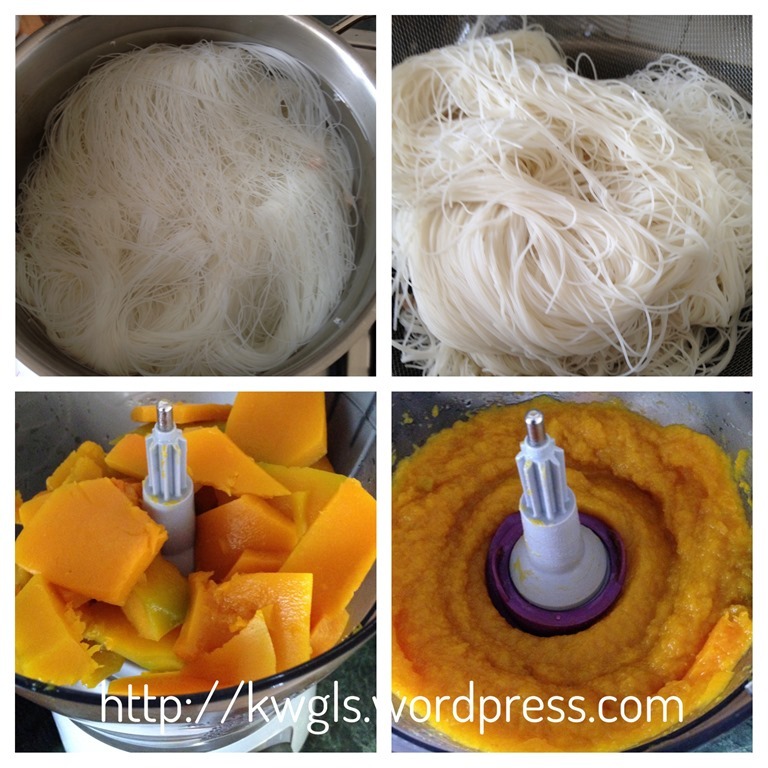 Either use fork to mash or transfer to a food processor to blend until puree form. Set aside for later use. (note that this step is optional if you prefer to slice your pumpkin into thin strips. In a frying pan, add 2 tablespoons of cooking oil. Add the spring onions, sliced shallots and winter mushrooms, sauté until fragrant and the shallots are slightly brown. 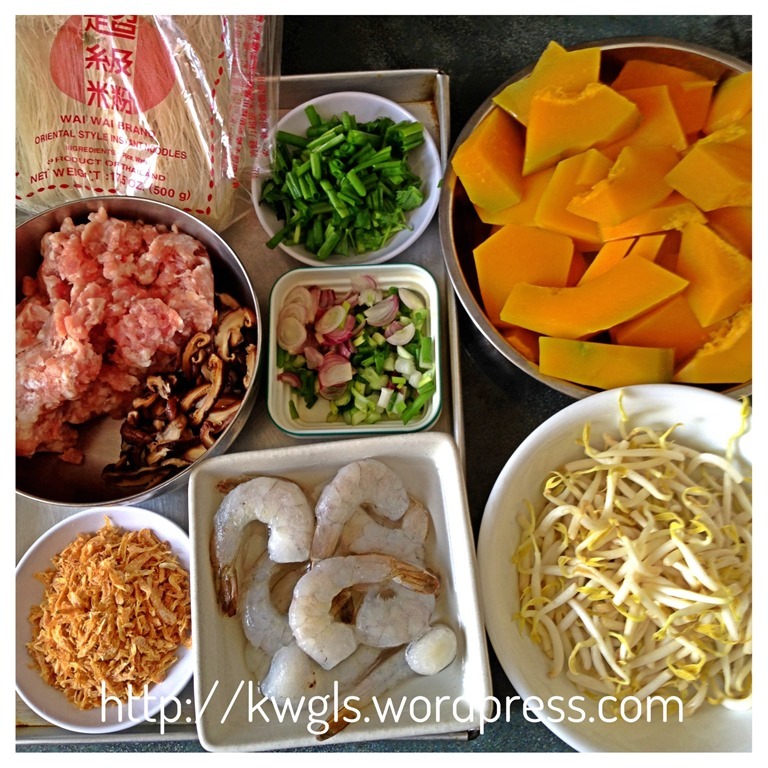 Add the dry shrimps or dry squid strips (鱿鱼丝）。 Stir fry for a minute of two. 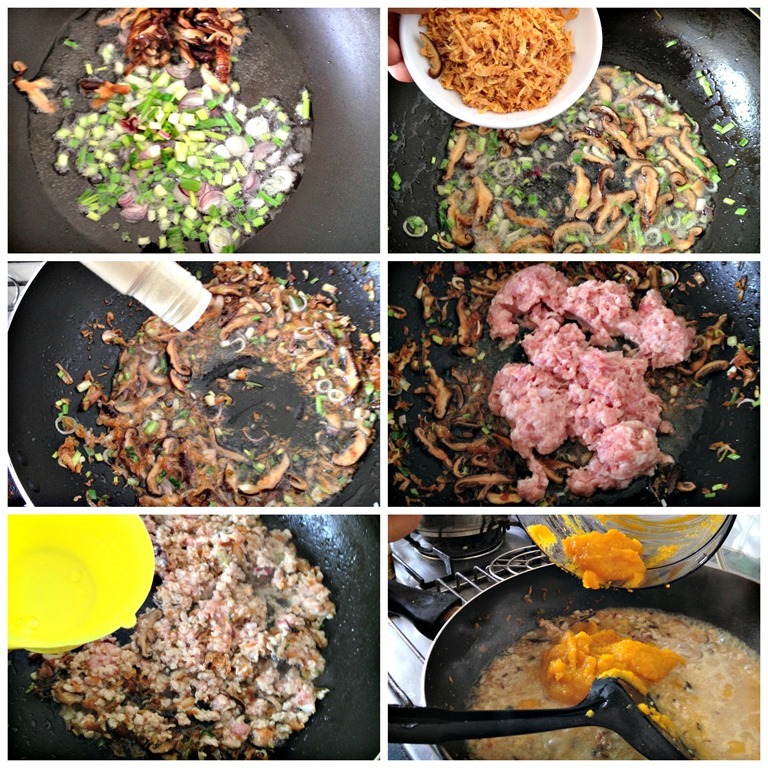 Add dashes of white pepper followed by the minced meat or pork belly strips. Add about 2-3 cups of water and the chicken stock cubes, bring to boil and let it simmer for about 10 minutes to get the meat stock. Add the pumpkin puree and stir until well mixed. Add the bee hoon and stir until well mix. 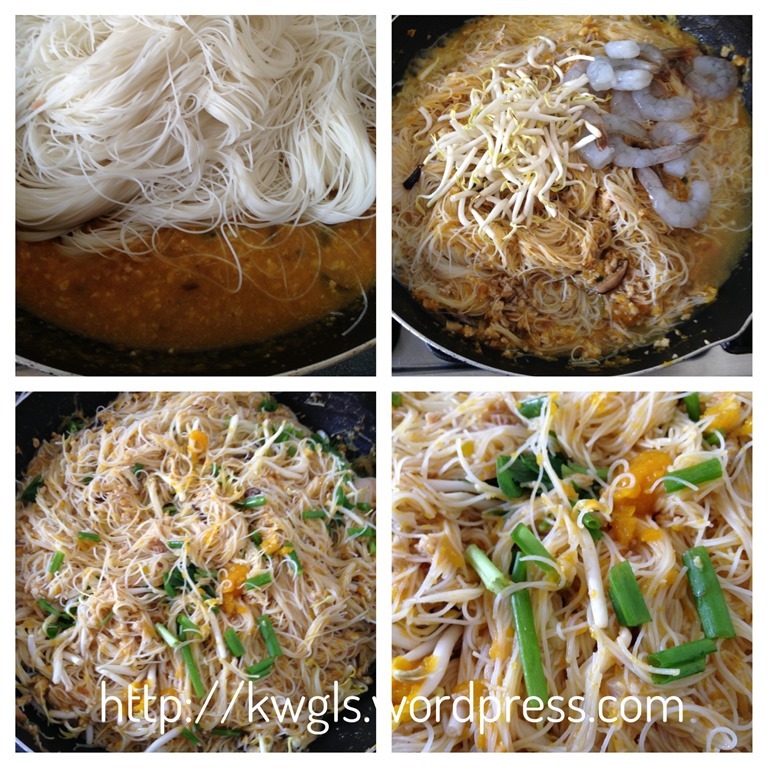 Reduce the heat to low and braised the bee hoon until your desired texture. 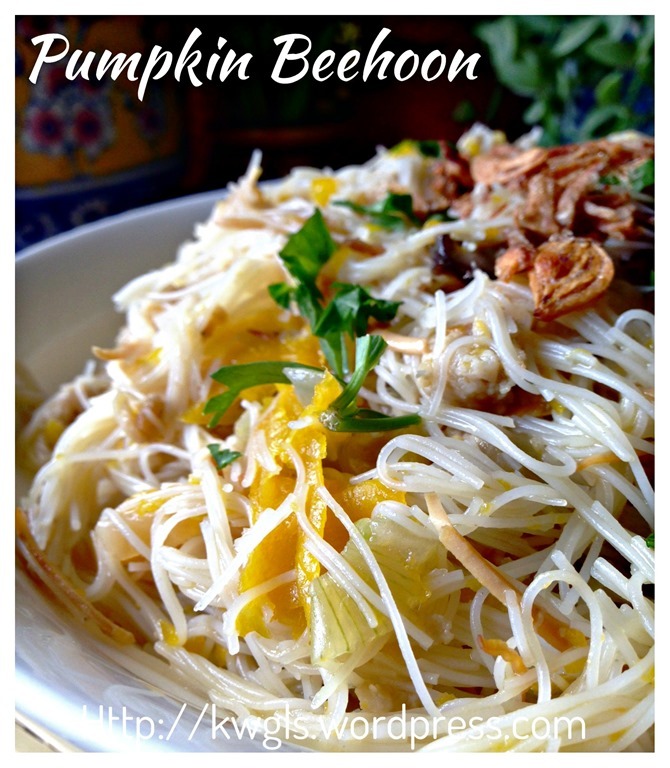 Don’t worry that if the soup stock is too much, it will gradually absorbed by the bee hoon . If the soup dries up too fast, add more water. 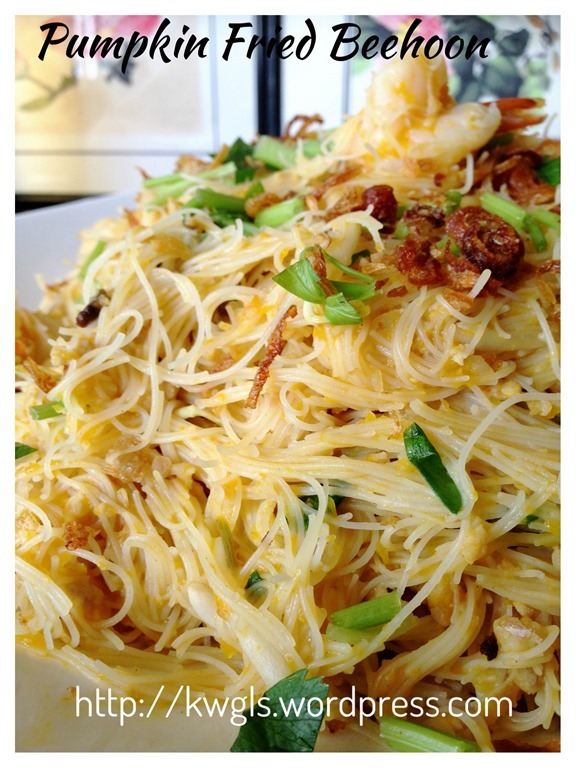 The longer you braised, the softer and flavourful is the bee hoon. Once it reaches your desired texture, add the bean sprouts and prawns, increase the heat to medium and stir fry until the prawns are cooked. Add in additional spring onion or deep fried shallots before dishing up. Prior to servings, sprinkle with deep fried shallots if desired. I hope readers do give this recipe a chance. 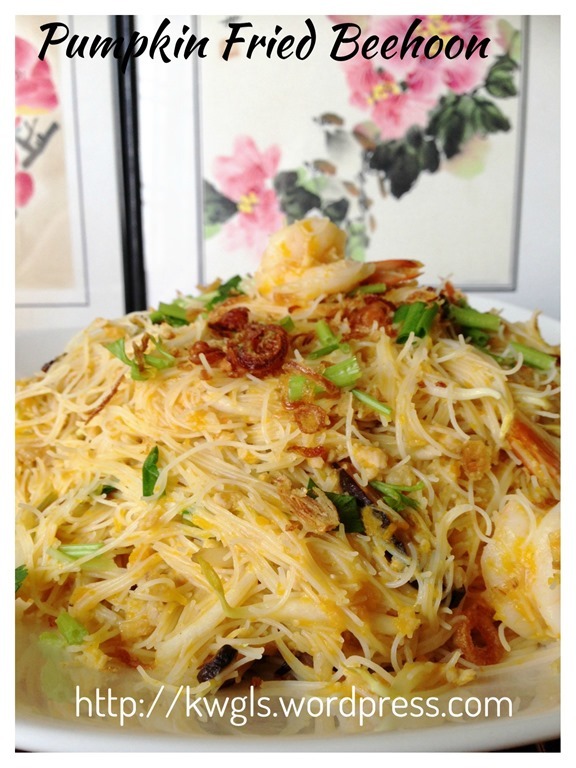 The method of cooking is rather controversial but trust me, it will yields a delicious plate of fried bee hoon. 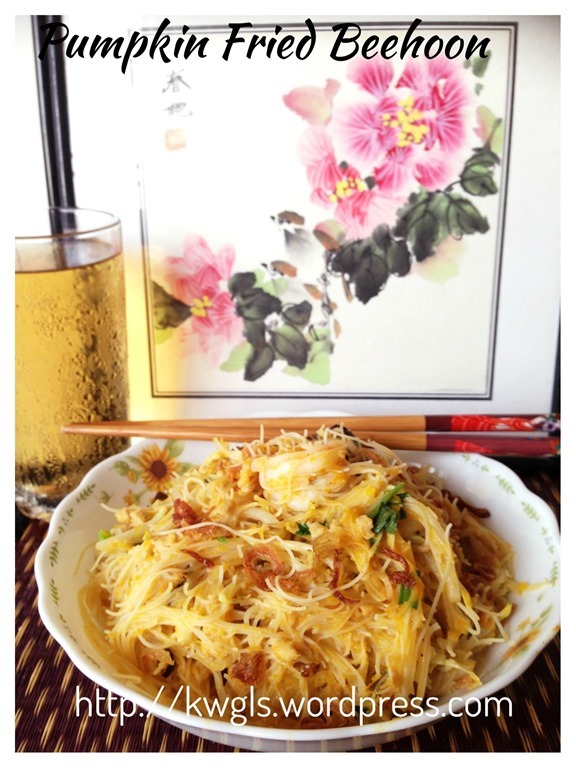 This entry was posted in Food Preparation Series, Noodles, Rice and Others and tagged 金瓜炒米粉, 金瓜米粉, GUAI SHU SHU, Guaishushu, kenneth goh, postaday, pumpkin fried bee hoon, pumpkin fried rice vermicelli, 南瓜米粉. Bookmark the permalink.